A piano and trombone student from an early age, Steven found inspiration to go into the music business at the age of 13 while watching Steven Spielberg's “Hook;” he would forevermore hold John William's brilliant score to this film responsible for drawing him into a career in music. Steven brought this newfound passion to his first composition, “Vertigo” for solo piano, as well as every performing ensemble he joined, including the Cavaliers Drum and Bugle Corps. He went on to earn a Bachelors Degree in Music Theory and Composition from Illinois State University (ISU) and a Graduate Certificate in Film and Television Scoring from the University of Southern California (USC). 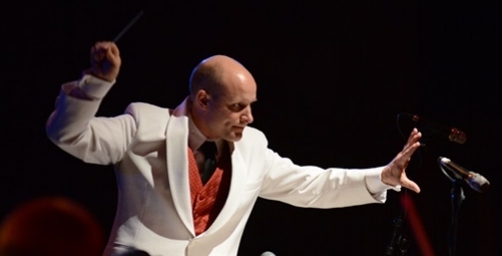 Steven founded the Golden State Pops Orchestra (GSPO) in 2002 to be a year round pops orchestra that brings the dramatic music he loves to the concert stage; since then, the GSPO has gained international acclaim, drawing fans to L.A. from across the country and world. GSPO has given Steven the opportunity to work with some of the most influential composers, artists and production companies in the industry and to conduct on such world-renowned stages as Nokia Theatre, Dorothy Chandler Pavilion, Orange County Performing Arts Center, Auditorio de Tenerife, San Diego Civic Theatre, Paramount Studios and Skywalker Sound. Notable professionals Steven has worked with include composers Alan Silvestri, Bear McCreary, Christopher Lennertz, Christopher Tin, Christopher Young, John Ottman, Richard Sherman, Russell Brower, Sam Spence, Stu Phillips, Tommy Tallarico and performers Barbara Morrison, Tina Guo, the rock band Dishwalla and Dave Lombardo from the rock band Slayer. Steven continues to compose for films and to create stage works that bring together different art forms in a collaborative format. Currently he is revisiting the sci-fi superhero project “BattleWorlds” with George Edwards while planning future seasons for the Golden State Pops Orchestra and El Segundo Concert Band. Victor Pesavento is a Los Angeles based orchestrator and arranger. Recently, Victor orchestrated for the TV mini-series documentary Cosmos: A SpaceTime Odyssey and feature films Rio 2, Monsters University and The Croods. He arranged music for the 2011, 2013 and 2014 Academy Awards, for The Simpsons Take The Bowl concert at the Hollywood Bowl in 2014 and for Jessica Sanchez's runner-up performance in the American Idol Season 11 finals. Victor has prepared music for Josh Groban, Tony Bennett, composers John Williams, James Newton Howard and Alan Silvestri, and over 350 motion pictures that have recently included Star Wars: Episode VII - The Force Awakens, Frozen, Life of Pi, The Grand Budapest Hotel, The Avengers and How To Train Your Dragon 2. Other credits include various installments of the Indiana Jones, Harry Potter, Hunger Games franchises, as well as Tony Award nominated musicals Catch Me If You Can and Beautiful: The Carole King Musical. The past two years have seen Victor sharing his time between Los Angeles and Wellington, New Zealand, where he worked with the New Zealand Symphony Orchestra to record the scores to the second and third Hobbit films with Howard Shore and Peter Jackson. As a music librarian, he toured internationally with Star Wars In Concert (2009) and with Barbara Streisand: Back to Brooklyn (2012-2013). Victor’s arrangements have been recorded by the London Symphony Orchestraand the Royal Philharmonic Orchestra, performed by such notable artists and ensembles as Jennifer Hudson, Jennifer Holliday, Patti LuPone, Shirley MacLaine, the National Symphony Orchestra, and featured in the Ghent Film Festival, the Tenerife International Film Music Festival and Hollywood In Vienna (Festival der Filmmusik).